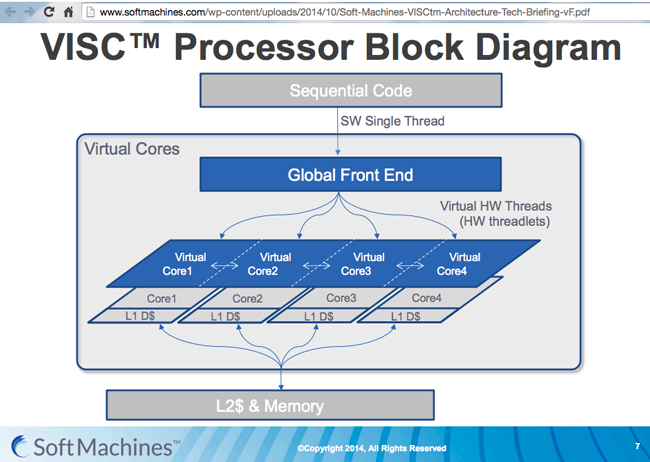 Unlike conventional microprocessors based on CISC and RISC architectures that make use of “physical cores” and “software threads,” the Soft Machines' VISC architecture enables dynamic allocation and sharing of resources across cores. The company claims its design achieves 3-4 times more instructions per cycle (IPC), resulting in 2-4 times higher performance per watt on single- and multi-threaded applications. The architecture also leverages a light-weight “virtual software layer”, something the company believes will can give it the flexibility to adapt to new software ecosystems. The company has raised over $125 million in venture funding to date. So far, it has filed for over 75 U.S. patents. Soft Machines now has working silicon, proving out its design. Soft Machines was founded seven years ago by Mohammad Abdallah and Mahesh Lingareddy. Prior to founding Soft Machines, Mr. Abdallah worked from 1995 to 2005 as a computer architect at Intel, where he held a series of positions, most recently as a Senior Architect in Intel’s Microprocessor Architecture Group. Mr. Lingareddy also previously worked at Intel, where he was a Design Manager in Intel’s Microprocessor Product Group. The FCC cleared Level 3's pending acquisition of tw telecom. 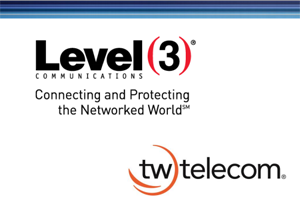 In June 2014 Level 3 Communications agreed to acquire tw telecom in a deal that will combine its global fiber network and international data centers with tw telecom's extensive metro footprint in major U.S. markets. The stock-and-cash transaction was valued at $40.86 per TWTC share, or $5.7 billion in aggregate, based on market close as of June 13, 2014. tw telecom stockholders will receive $10 cash and 0.7 shares of Level 3 common stock for each share of tw telecom common stock that is owned at closing. Level 3 has already lined up $3 billion of committed financing for the acquisition. Level 3 is based in Broomfield, Colorado and has 10,200 employees. 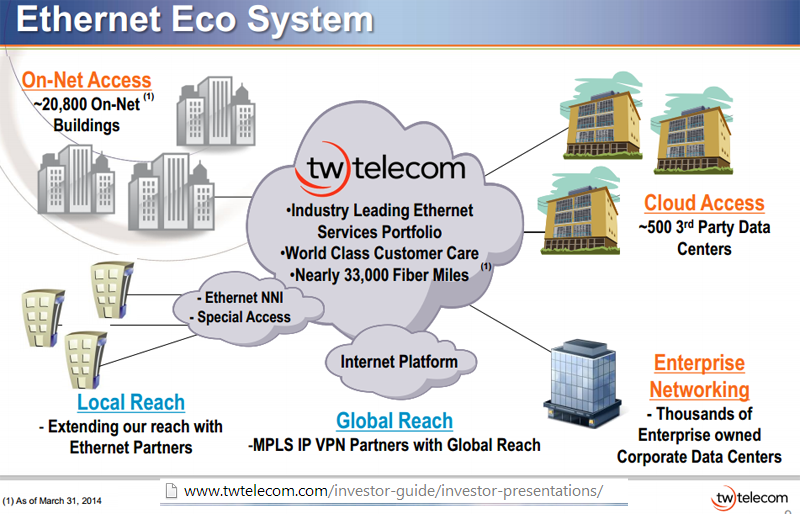 tw telecom is based in Littleton, Colorado and has 3,407 employees. Rogers Communications activated LTE-Advanced in 12 cities across Canada: Vancouver, Edmonton, Calgary, Windsor, London, Hamilton, Toronto, Kingston, Moncton, Fredericton, Halifax and Saint John. 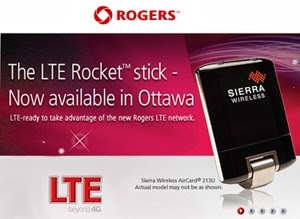 Rogers' LTE-Advanced combines its 700MHz and AWS spectrum. Rogers was the only carrier to secure two blocks of contiguous 700MHz spectrum across the country's major geographic markets. "This new network technology allows us to combine our 700MHz beachfront spectrum with AWS, the backbone of our LTE network, to give our customers an even better and faster video experience. It's like putting the highways in a major city together to make a superhighway, allowing more traffic at faster speeds," said Guy Laurence, President and Chief Executive Officer. 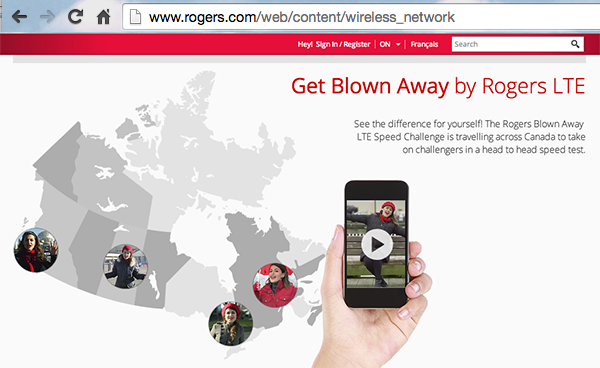 As of 30-Sept-2014, Rogers' LTE network reached approximately 79% of Canada’s population. In March 2014, Rogers Communications secured approximately $2.1 billion in funding for paying for 20 year licenses for two contiguous, paired blocks of lower band spectrum - acquired in the recent 700 MHz spectrum auction. Combined with cash on hand, Rogers will pay $3.29 billion for the spectrum covering both rural and urban areas across Canada. "We went after and won this spectrum because we know it will pay off for our customers for the next 20 years and likely beyond. Not only did we get the spectrum we wanted for our customers, but we have financed it with $2.1 billion of long term funding for up to 30 years at some of our lowest rates ever, with an average interest rate of just 3.9%. In addition, we have made this long term investment for our customers while maintaining our Baa1/BBB+/BBB+ senior credit ratings, which have been affirmed by each of Moody's, Standard and Poor's and Fitch, reflecting their confidence in the investment and in Rogers," said Anthony Staffieri, Chief Financial Officer, Rogers Communications.